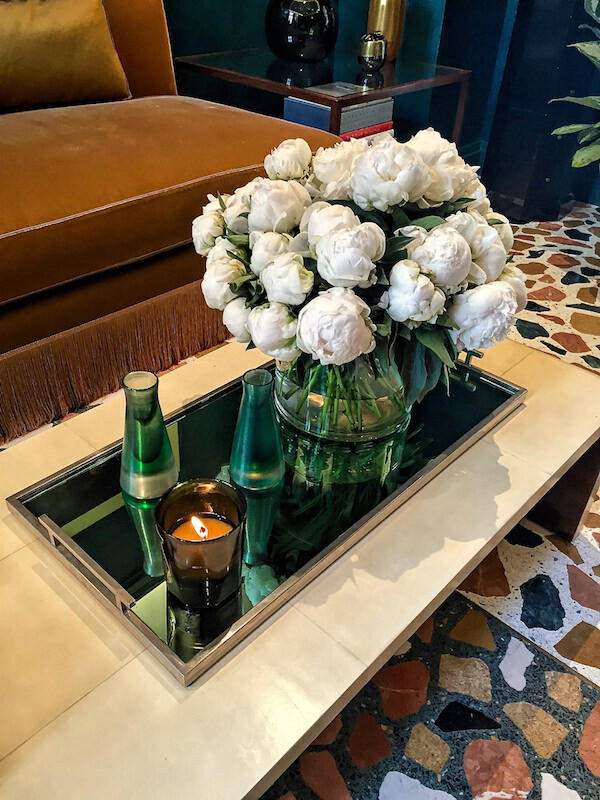 Influenced by one of the great examples of 1930’s Italian residential architecture, the Sawyer Berson Kips Bay Show House Petit Salon is a jewel of restrained elegance. The design vocabulary of Sawyer Berson is a wide ranging one, including both traditional and modern styles encompassing architecture, interiors and landscape projects. Referencing the extraordinary Villa Necchi in Milan offered the firm the opportunity to show off their multidisciplinary talents. 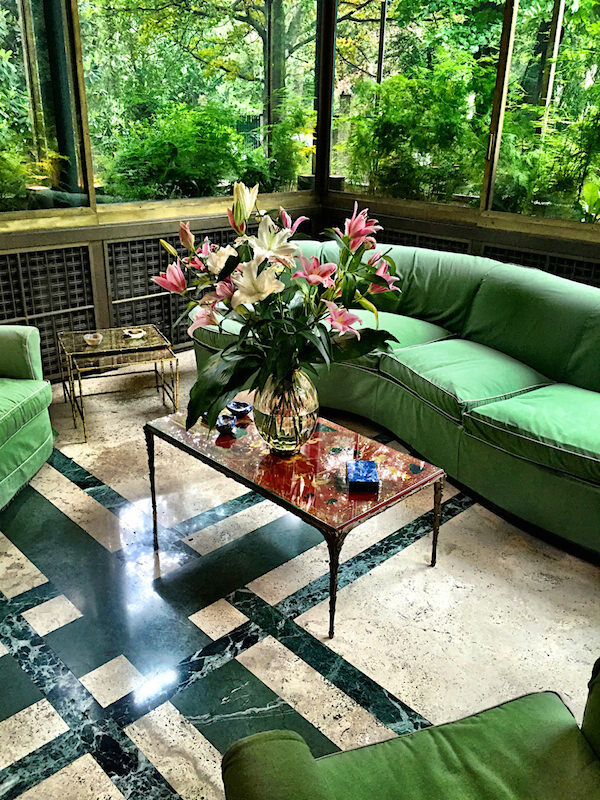 I finally visited Villa Necchi last year and was awed by the brilliance of architect Piero Portaluppi’s masterpiece. The garden room in particular, below, is the muse for Sawyer Berson’s fresh modern vision. Utilizing a similar but deepened palette of green and gold, the petit salon embraces rich textures and materials. Venetian plaster walls offer a saturated tactile backdrop for the chic low silhouettes of an armless sofa in Holland & Sherry velvet and Jacques Adnet parchment table from Bernd Goeckler. 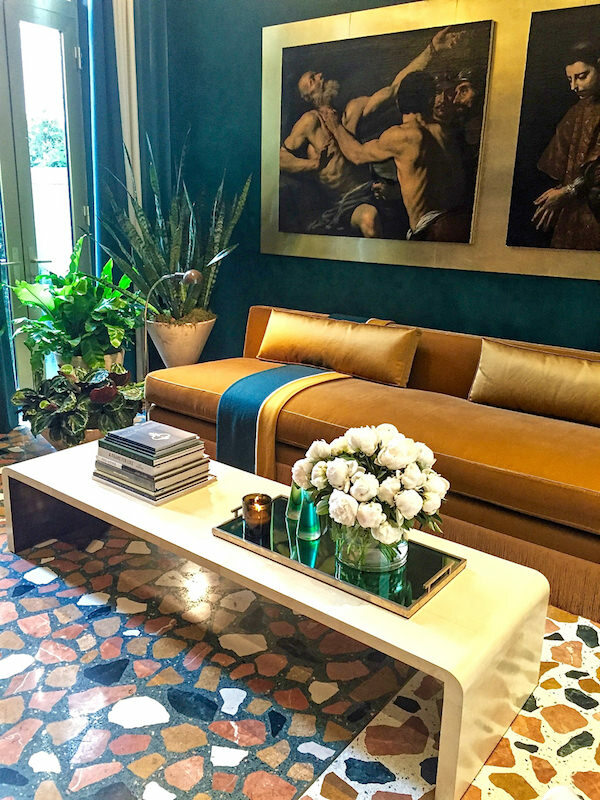 But the stars of the room had to be the treatment of the art above the sofa and the spectacular terrazzo floor. Taking the two 17th century Andrea Vaccaro martyrdom paintings from distinguished Old Masters dealer Otto Naumann out of their baroque frames and placing them against a brass panel (executed by Remains Lighting) lends them a geometric halo of metallic modernity. And I love the visual dialogue with the Achille Salvagni spider chandelier (see top photo). 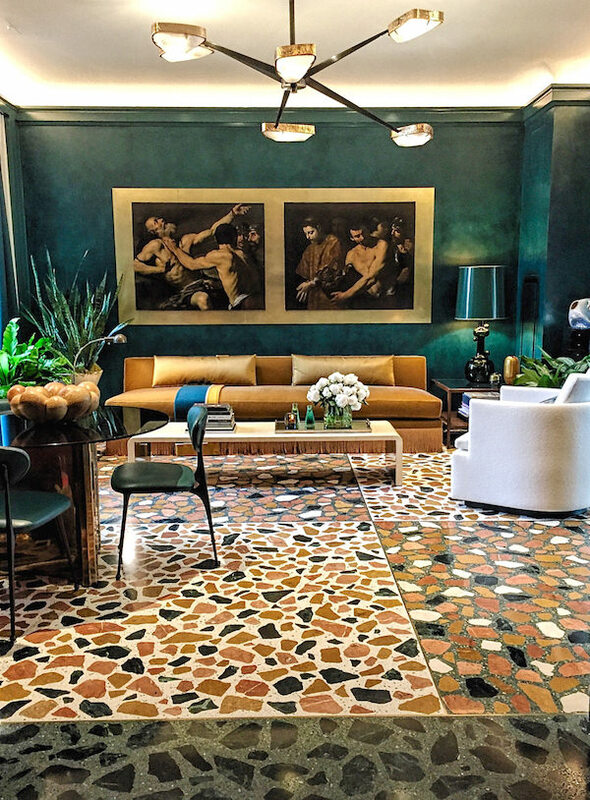 The floor, from Durite, is a masterful installation that, while echoing the green and white matrices of Villa Necchi, adds updated pattern and movement to the space. 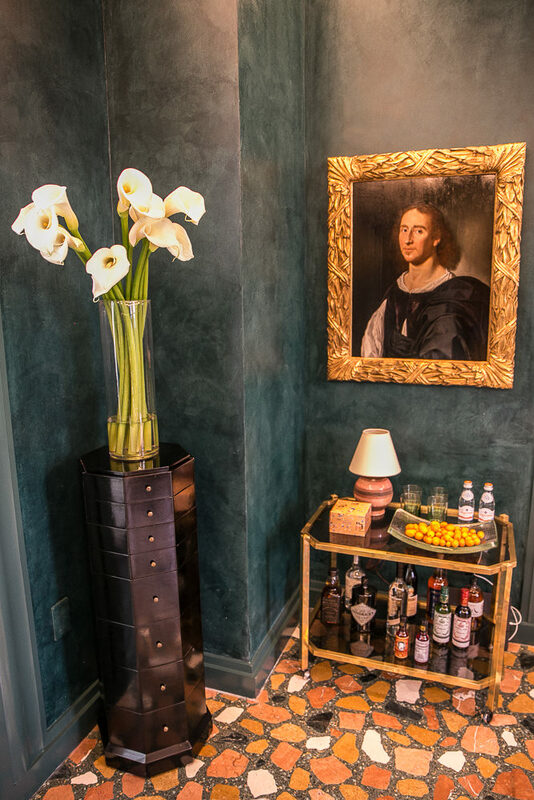 A corner vignette features the strong lines of a black lacquer pedestal from Alan Moss and 1960’s bar cart from Bermingham & Co set against a 17th c. portrait by Dutch artist Jan van Bijlert (also from Otto Naumann), which, like the Vaccaros, reflect the influence of Caravaggio’s dramatic chiaroscuro. 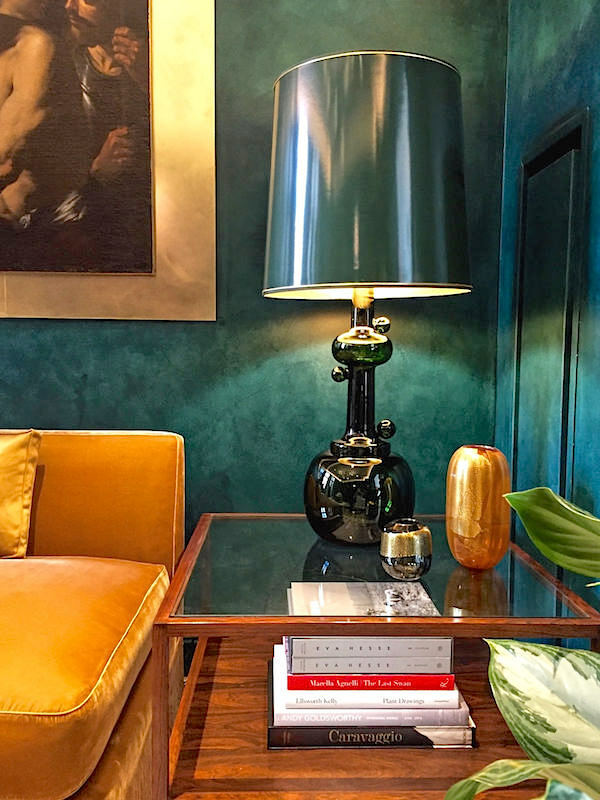 Michael Bang’s stunning lamp from HM Luther above, and contemporary green vases below helped feed my current obsession with green glass. 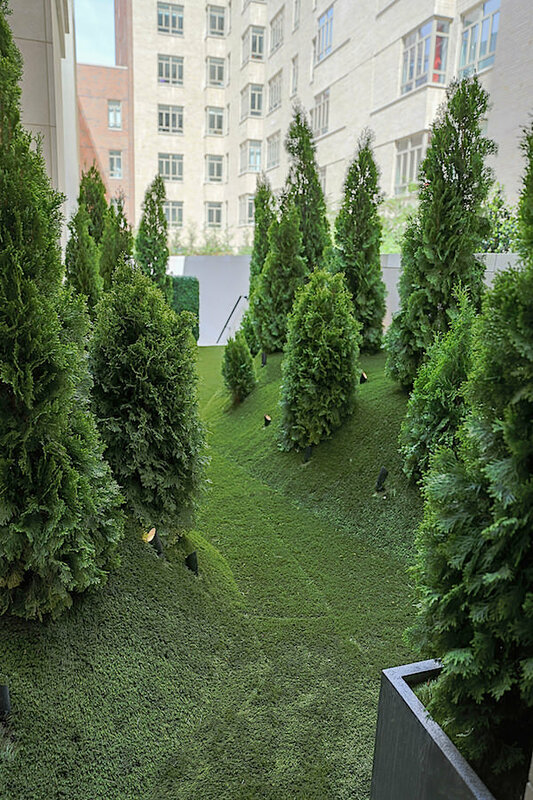 In true multidisciplinary style, the Sawyer Berson Kips Bay space also included the adjoining terrace, transformed into a lush “Tuscan fantasy garden” of rolling hills and arborvitae. It proves that integrating inside and out is an important aspect of design and essential to the Sawyer Berson ethos. Here they have given ample attention to not just how the room looks and feels but, like the Villa Necchi garden room, how it’s connected to the vista beyond. This entry posted in architecture, art, design, interior design. Entry Tags: interior design, Kips Bay decorator show house, Kips Bay Show house, Sawyer Berson Bookmark the permalink. Inside and out-standing!! franki p.s. THOSE WALLS….lust!! Kips Bay is always an inspiration! Amazing! Love the design! Nice garden. Fantastic! Fresh and modern while avoiding the all too frequent mid- century ubiquitous cliches. The incorporation of the classical art in a unique manner is particularly refreshing. Plus the green is restful and rejuvenating. Stunning! Absolutely stunning!! And those floors……..
81 queries in 0.452 seconds.